Hawes Water is the most eastern of the famous lakes in Cumbria, England. Henry George Alexander Holiday (1839-1927) is not best known as a landscape painter. However, this scene has the same careful observation of nature and brilliance of light found in the work of the Pre-Raphaelite Brotherhood. This group of British artists, active from 1848 to 1853, believed in 'truth to nature'. Holiday designed stained glass, mosaics and murals for new buildings, such as the town halls of Bradford and Rochdale in Yorkshire, England. 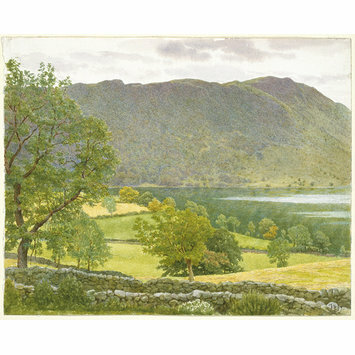 Landscape depicting Hawes Water and Nadale Forest from Measland. Hawes Water is the easternmost of the famous Lakes, in Cumbria in the north of England. Although not primarily known as a landscape painter, Holiday brings the same observation of detail and brilliance of light as the best of the Pre-Raphaelites. 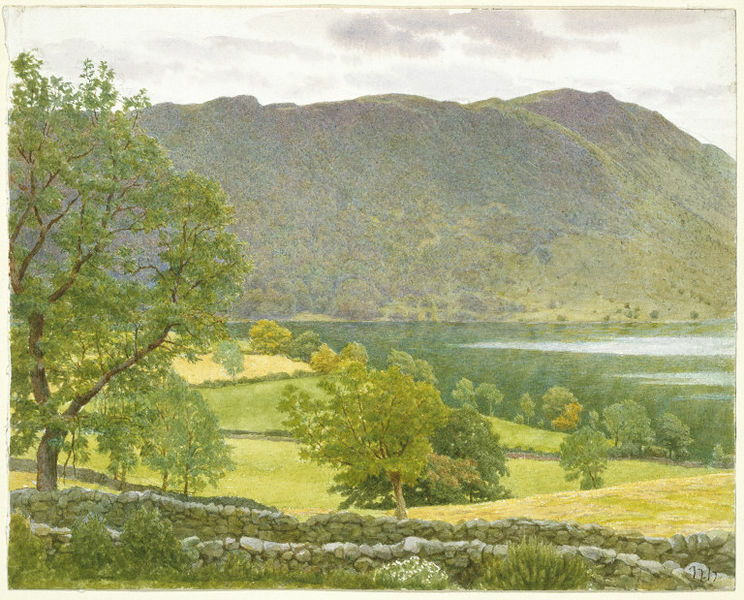 Watercolour depicting Hawes Water and Nadale Forest from Measland by Henry George Alexander Holiday. Great Britain, Britain, ca. 1859.